Enjoy the 4th of July fireworks, presented by the TC Boom Boom Club. 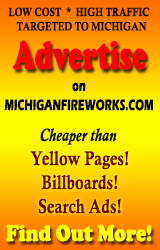 Fireworks can be viewed along the south end of West Grand Traverse Bay, near the Festival Open Space Park, Clinch Park Marina, Bryant and West End Beaches. Display starts at dusk or 10:30 pm. I’m not sure whether or not it’s free – the website says $5 to $1500, which seems a bit much. Take some cash.